It was made to look so easy and in his eyes, it may well have been. As the Formula 1 field arrived at Clermont-Ferrand for the 1965 French Grand Prix, Lotus driver Jim Clark was quietly confident. After three rounds, the legendary Scot had a three-point advantage over BRM’s Graham Hill and a further four-point lead over future star Jackie Stewart. With reigning World Champion John Surtees 4th in the title hunt having amassed nine points, this was a stellar time for British motorsport. Clark though, had assumed his lead over Hill despite missing the Monaco Grand Prix. Targeting victory at the Indianapolis 500, Clark gave the Monte Carlo spectacle a miss, leaving Hill to pick up the spoils. It would be one of the few times that Clark would not be atop the middle step of the podium in 1965; however he made amends by taking the 500 mile race with style. Seventeen entrants turned up in the centre of France for the race, flanked by a sea of fans at the 48-turn course, situated near the mountains of Auvergne. Having been built around the sides of a dormant volcano, the lavish 5-mile circuit was considered a faster and twistier version of the Nordschleife. This was Clermont-Ferrand’s first Formula 1 event and, already, it was impressing. With skill and smoothness a premium, Clark possessed an advantage that often superseded the superb engineering of his nimble Lotus 33. For the chasing Hill, his weekend started off on the wrong foot. A stuck throttle caused a practice crash that left the 1962 World Champion with a sore neck – the king of Monaco realised early that this was a weekend of damage limitation. Clark also had his problems during practice as a broken suspension stranded the Lotus driver in the French hills. Several drivers knew the circuit from Formula 2 competition, including Stewart and Brabham new boy, Denny Hulme. The 28 year-old Hulme had only made his Grand Prix début at Monaco four weeks earlier and acknowledging Hulme’s previous experience, team boss Jack Brabham handed his BT11 over to the Kiwi. Hulme led the practice standings come Friday evening as the future World Champion settled in with the Brabham team. Surtees and Lotus’ Mike Spence had also competed at the circuit before and it showed in the practice times. Friday turned to Saturday and for a time, dark clouds shrouded Clermont-Ferrand. Had rain fallen, it may well have given Hulme top spot in only his second race, but the clouds dissipated early on, leaving Clark to take yet another pole ahead of Stewart and Lorenzo Bandini (Ferrari). Surtees and Dan Gurney secured the second row; however Hulme had done enough to hold onto 6th on the grid. In the race, Clark made it look easy. The 1.5 litre V8 Climax-powered Lotus romped into an early lead and never looked back and eventually led the way for the entire 40-lap distance. Unfortunately for Bandini, his front-row starting spot would not materialise into a race winning proposition and by the second lap, Stewart had passed the Italian. One tour later, 3rd became 5th when Surtees and Gurney got by the Ferrari man. The under pressure Bandini held off the Honda of Richie Ginther, while Spence, Bruce McLaren and Hulme sat in waiting. Two drivers that would not be able to take advantage of the struggling Bandini were Jochen Rindt and Chris Amon – the pair collided early on and although Amon continued in his (slightly battered) Lotus-BRM, Rindt was out with a damaged front wheel. It mattered little as Amon would eventually retire from the race; the Kiwi’s fuel-system registered a failure on the 21st lap. Amon joined his teammate Innes Ireland on the sidelines; Ireland having retired three laps earlier with a strangled gearbox. Away from all the commotion of banging wheels, position swapping and aching machinery, Clark and Stewart pulled away, but on this day Clark was simply imperious. By the time the chequered flag dropped, Clark was a clear 26 seconds ahead of Stewart; however the 1963 World Champion had decided to lean off the power late on, as fears regarding the strength of the Coventry Climax became more apparent. Surtees held on to 3rd place, but was over 2-and-a-half minutes off of Clark; however rather than the ever dangerous Gurney, his main challenge came from the youthful charge Denny Hulme. 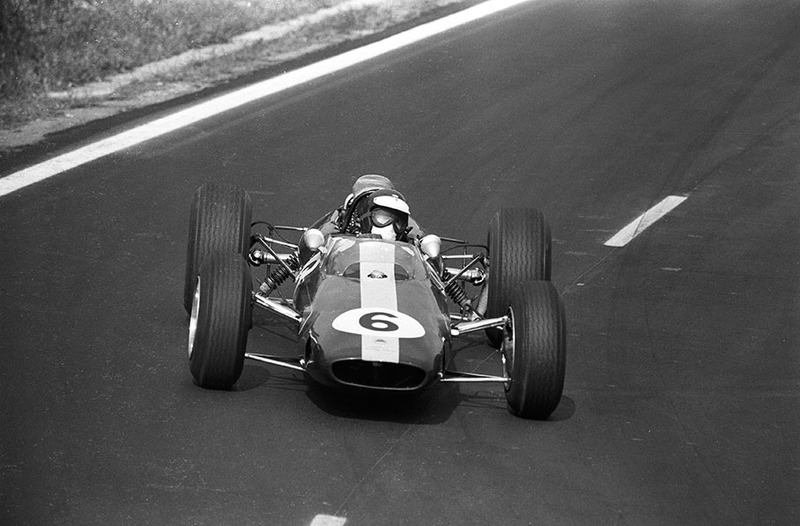 In fact Gurney had disappeared long ago – as the American reached the one-third distance, his Brabham began to cough unsympathetically and finally gave up on the 16th lap. Gurney’s Brabham teammates – Jo Bonnier and Bob Anderson – would also drop out of the race due to electrical problems and with six laps remaining, Brabham’s five car assault had become a paltry duo of just Hulme and Siffert. For his worth Hulme persevered when in the pack behind Bandini and picked up position after position, while others fell by the wayside. It had become a poor day for the Honda team. Both of their entries – Ginther and Ronnie Bucknum – had also retired with sick machines before the race had reached puberty. McLaren also hit trouble as the handling on his Cooper-Climax fell away. Spence, meanwhile, simply ran out of pace once Hulme had forced his way passed him. Hulme entertained thoughts off challenging Surtees for the final podium spot, but with the end of the race looming, the Brabham’s oil pressure dropped alarmingly and Kiwi decided on taking 4th place instead rather than risk it all. 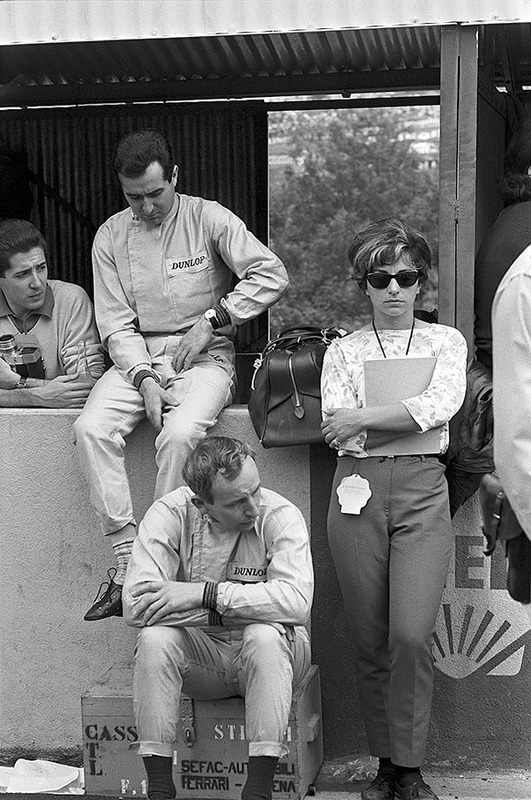 By now, it was clear that Bandini was suffering at the hands of a failing Ferrari and continued to drop down the order and as the race aged – even Hill and Siffert had reeled the Ferrari driver in, until Bandini spun off on lap 36. All of this gave Hill 5th place ahead of the Swiss Siffert – although it was damage limitation for Hill, even he would have wished for better than that. Spence – his momentum shattered – was never in contention once Hulme had passed him and could only bring his Lotus home 7th and last of the finishers. Though the season was still relatively young, Clark was on a roll. The Scot was now a full ten points clear of Clark and Stewart in the driver’s Championship, while the Lotus had shot to the top of the Constructor’s standings. Visits to Silverstone, Zandvoort and the Nordschleife all delivered Clark victories giving him a run of seven straights wins (if one includes his Indianapolis entry as opposed to Monaco). There were also victories in non-Championship events at Syracuse and Goodwood – this truly was the year of Clark. Following the German Grand Prix, Clark was in line to win at Monza until a fuel pump failure gave the race to Stewart. Engine failures at Watkins Glen and Mexico City saw Hill and Ginther claim those Grand Prix., but it was nowhere near enough to catch Clark. These races give the impression of the World Championship being closer than it actually was, when in reality Clark could well have won every single race. 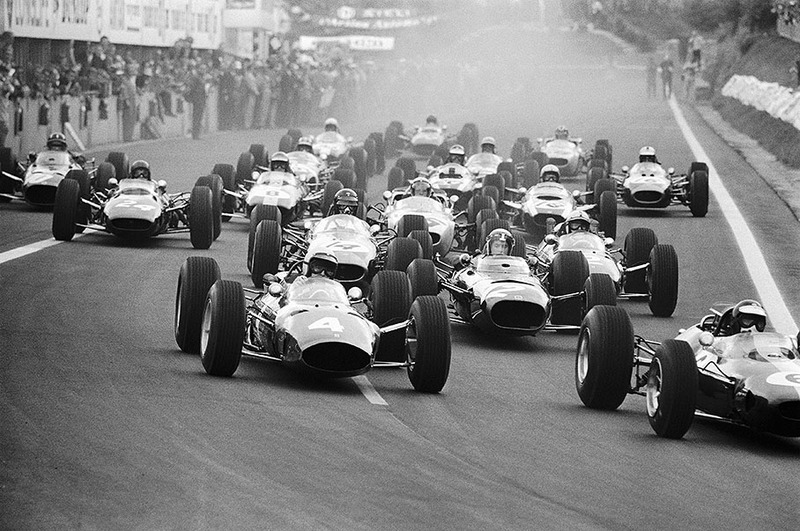 During the mid-60’s, only the six best results counted and as such Clark had scored the maximum amount of points available – in the end, the Scot had 54 points, to Hill’s 40 and Stewart’s 33. The Championship was always going to be his. 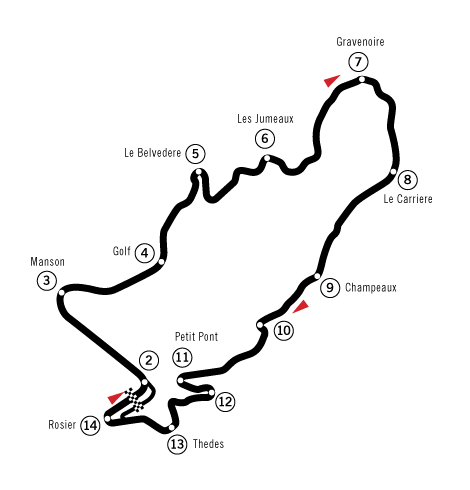 As for Clermont-Ferrand, the circuit would hold three more World Championship races (1969, 1970 and 1970) while it swapped with Reims, the Bugatti track at Le Mans and the then-new Circuit Paul Ricard. Sadly, during the final Grand Prix at the circuit, a stone thrown by Emerson Fittipaldi’s Lotus punctured the helmet of BRM’s Helmut Marko causing the Austrian driver to lose an eye. It instantly ended the career of a promising driver and also ended Clermont-Ferrand’s relationship with Formula 1. As loved as the circuit was, it was simply too daunting for the machinery of the 1970’s – a lesson that the Nordschleife would have to accept several years later. Yet for many, Clermont-Ferrand will always be synonymous with a dominant Jim Clark – a great driver and fabulous car at one and on top of the game and that alone is a wonderful thought. Just magnificent footage. I could watch about 50 hours of that stuff. Great write up, too, Leigh.